The Waverley brownall range of stainless steel check valves is one of the most comprehensive in the World. Our standard valve is the CV series which is designed to give unidirectional flow control of liquids and gases with a minimal pressure drop. It is a general purpose poppet type check valve for flow control up to pressures of 3000 psi. 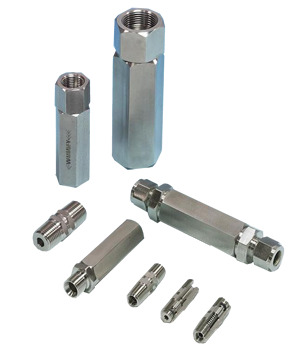 The CV series is available in a wide range of inlet and outlet port connections from 1/4″ to 1/2″. The Waverley brownall mini valve is the MCV and ACV series which are miniature, compact one piece body check valves for unidirectional control of flow up to pressures of 6000 psi. The MCV is our standard pre-set Mini valve while the ACV series valve comes with an adjustable spring to give a variable cracking pressure. Body precision machined from 316 Stainless Steel incorporating male female threaded connections, Duoloc® and Ringlok® compression ends. 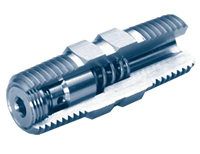 Poppet machined from 316 stainless steel incorporating PTFE or Viton seal. Choice of springs for a range of preset cracking pressures. Endcap manufactured from 316 stainless steel, with precision machined cone for bubble tight shut off (PTFE or Viton seal). Seal kits are supplied for necessary maintenance. These consist of poppet and endcap seals and a new spring. All check valves are dispatched fully degreased and sealed. Cleaning for oxygen use on application. Working pressure up to 6,000psi. Adjustable spring Lock screw to maintain crack pressure. Spring material is 304 Stainless Steel as standard. 316 Stainless Steel available as an option. Please specify on order. Waverley check valves have been tested for sealing performance based on BS 6755 Pt1. These tests consist of: Low pressure (50psi 3.5 bar) High pressure shell (9,000psi 620 bar).